^ 1.0 1.1 1.2 1.3 1.4 Tiësto Blog. Tiësto Biography. Tiësto Blog. [2018-07-09] （英语）. ^ Ollison, Rashod. Tiësto gets 'em dancing with trance, electro-house. The Virginian-Pilot. 20 September 2011 [2017-08-21] （英语）. ^ Tiësto exits the big room with his mellowed-out new label, AFTR:HRS. beatport.com. （原始内容存档于2016-05-11） （英语）. 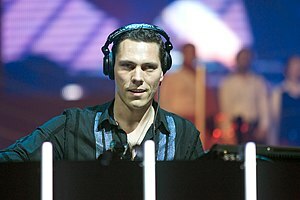 ^ DJ Tiësto profile. Allmusic. [2018-07-09]. ^ Bhansali, Akshay. 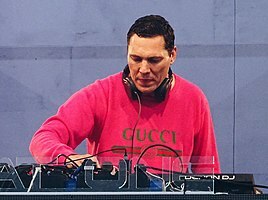 Tiesto's 'Greatest DJ Of All Time' Title Earns David Guetta's 'Respect' [提雅斯多的「史上最偉大DJ」稱號贏得大衛·庫塔的「敬重」]. MTV News (MTV). 21 January 2011 [2016-10-09] （英语）. ^ Whitehurst, Andrew. TIESTO: LEGEND. Dutch DJ on his Top 100 DJs Legend Award [TIESTO：傳奇。荷蘭DJ獲得他的百大DJ之傳奇大獎]. DJ Mag. 6 November 2013 [2016-12-27] （英语）. ^ Lifestyles Of The Superstar DJs – How Calvin Harris, David Guetta And More Live - NME. NME. 2015-10-16 [2017-04-28] （英语）. ^ Woods, Rachel. Tiesto Shares the Diverse Taste of AFTR:HRS With New Compilation. EDM.com. 2016-12-26 [2017-04-28]. （原始内容存档于2017年5月2日） （英语）. ^ Tiësto Explains the Universe (of EDM). Spin. 2014-06-20 [2017-04-28] （英语）. ^ Lambert, Eleanor. Why Tiësto Is Tired of All the Subgenre Labeling in Dance Music. Village Voice. 2015-01-14 [2017-04-28]. ^ Tyler. What Ever Happened to The "Gods Of Trance"?. Magnetic Magazine. 3 March 2016 [2017-04-28] （英语）. ^ White, Caitlin. Diplo, Disclosure And A Few More 'Superstar DJs' Are Getting Their Own TV Show. MTV News. 20 June 2014 [2017-04-28] （英语）. ^ Superstar DJs With Annie Mac Debuts on June 25. Complex. [2017-04-28] （英语）. ^ Andrew Claps. Tiësto Releases New AFTR:HRS Compilation Album. Your EDM. 2016-12-26 [2017-04-28]. ^ Andres, Jose. Tiesto Releases Brand New AFTR:HRS Compilation Album. Relentless Beats. [2017-04-28] （英语）. ^ Tan, Emily. Tiësto Returns With "Elements of Life", Another Crowd-Pleasing Dish of Melodic Trance. But Is The World's Biggest DJ Still Following His Muse?. DJ Times Magazine. June 2007 [29 April 2011]. （原始内容存档于2011-09-28）. ^ 50th Annual Grammy Awards Nominations. Variety. 6 December 2007 [2007-12-05]. ^ 20.0 20.1 Dancing Astronaut Staff. Tiësto wins Grammy for Best Remixed Recording, Non Classical. Dancing Astronaut. February 8, 2015 [2017-07-18]. ^ Tiesto celebrates two gold-certified singles at Hakkasan Gold Party. 15 September 2014 [2016-10-23] （英语）. ^ DJ Magazine. Tiesto: "Why I left trance" [提雅斯多：我為什麼離開出神]. YouTube. DJ Magazine. 10 April 2014 [2018-07-09] （英语）. ^ Leight, Elias. Tiësto Launches AFTR:HRS Deep House Sub-Label, Premieres BLR's 'Nungwi': Exclusive. Billboard. April 25, 2016 [2016-05-03] （英语）. ^ Gregg, Cameron. Tiësto Unveils Sub-Label AFTR:HRS with Inaugural Track. Your EDM. April 26, 2016 [2016-07-15] （英语）. ^ Steve Aoki 'I'll Sleep When I'm Dead' Documentary Hits Netflix | The Nocturnal Times. www.thenocturnaltimes.com. [2017-07-27] （英语）. ^ Tiesto Seizes the New Year and Celebrates His Birthday With 'On My Way'. Billboard magazine. [2018-07-09] （英语）. ^ Tam, Michael. Tiesto Releases Super Amped Up 'Clublife' Vol.5 China. EDM Tunes. October 6, 2017 [2017-10-31] （英语）. ^ Billboard Dance 100 Artists of 2018: The Complete List. Billboard. [2018-03-23] （英语）. ^ The Chainsmokers named top DJs in the world by Billboard. WJBD Radio. [2018-03-23]. （原始内容存档于2018-03-22） （英语）. ^ Tiësto. Forbes. 2015 [2016-04-28] （英语）.